My favorite time of the year is Fall. You can feel alive with the cool temperatures, the smell of leaves falling from the trees and the cozy warm feeling you get from the heat you get from your wood burning stove or fireplace. What a great time to sell your home! Spring and summer were pretty active with buyers and sellers; however, this is the time when things start slowing down in real estate and sellers take their properties off the market until spring, being hopeful to sell in the new year. Most of these people let their listing expire. Wewll my friend, THE TIME IS NOW TO LIST! Inventory is low and due to those who claim they will start up again in the spring - the market is wide open. Put your home in the face of potential buyers and make your home stand out. Jump on the opportunity now. I remember when I closed on my first house, we closed on the day before Thanksgiving. Wow! That was a mish-mash of Thanksgiving turkey and fixings. We won’t forget that year for sure. The Lakes Region is growing and people are relocating. I do a lot in relocations because RE/MAX is a world-wide company, so whether they are relocating from Texas to Maine or Maine to California - we do it all. 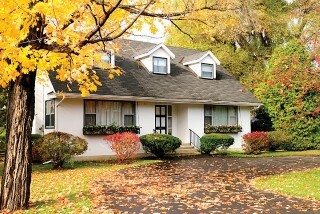 The homes listed at this time of year get sold because there is less to choose from. Once a home sells the new homeowners will have time to make it theirs. New kitchen, new floors, new paint or whatever it takes. Be proactive by standing out in your neighborhood. List it now before the snow comes our way, and ring in the New Year with a new chapter for you and your family in your new home. Richie Vraux is with RE/MAX Allied and a Broker/ Realtor for more than 20 years both in Massachusetts and in Maine. Call Richie for a consultation whether you are upsizing, downsizing, relocating or want to find your getaway home - I can help.